What better present for Christmas than photo gifts for the whole family and a new printer for the couponer in your life?? If you’re new to the online photo printing world (and the deal world) Snapfish is my #1 website for photo needs & deals! They always have great deals going on so you can get your photos at an unbeatable price! Right now through November 15th you can get BOGO sets of photo cards!. Holiday Cards (Starting as low as 29¢ per card) — Personalized cards are the perfect way to tell someone you’re thinking about them during the holiday season. Customize the cards with photos and personal sentiments, then grab a deal so that you can send them to everyone you love! Personalized Calendars (starting at $9.99) — The one gift that can is enjoyed 365 days a year!! Calendars make great holiday gifts, and can be customized with photos, special dates and reminders. From the collage poster calendar featuring up to 30 photos, to the various wall calendars (classic, glossy or square), these calendars make a chic home or office accessory. If you’re a gift procrastinator, you should consider the HP Faux Canvas available exclusively at Walmart which can be ordered and picked up in-store the same day. These start at $20 and you can customize this canvas-like wall decor with your favorite photos and design it in with any room. You can print anything you want on the fly including lab-quality photos with the HP Photosmart Printer. This printer even comes equipped with ePrint technology that allows you to print from virtually anywhere and from most devises (phone, tablet, computer/laptop). If you can email it, you can print it! 1. Comment: Out of all of your photos, which do you cherish most? 3. Follow Snapfish and Southern Savers on FACEBOOK, or DAILY EMAIL and leave a comment below that you are. This giveaway is sponsored by Snapfish by HP. I received products to review, but all opinions above are 100% my own. i definitely cherish my wedding pictures the most out of all my photos! I cherish my son’s wedding photos. He married a wonderful woman and we are so happy to have her as part of our family. I cherish the photos of my daughter as she has grown up! I cherish the photos of my children~ they grow up so fast!! cherish the baby photos the most, they grow so fast! The pictures of me and my dad because he is now in heaven. The photo I cherish the most is one of my three little boys–taken by a professional photographer shortly after we adopted our twins. All three are laying on the green grass, wearing white outfits–my eldest son (4 at the time) is smiling and his young twin brothers are on either side of him. One is kissing him on the shoulder and the other is holding his hand. I cherish the baby pictures of my children. I follow Snapfish and SS on FB and with daily email. Snapfish is one of my top “go to” sites for printing products–I take a LOT of pictures (hobby now, career someday maybe)….and they have wonderful products and fantastic quality. I cherish the baby photos of my girls when they were first born. I follow Snapfish on FB. I follow SoutherSavers on FB. My most cherished photos are of my siblings and I when we were growing up. I can’t get enough of the baby photos of my boys! Baby pictures of my son and my wedding are the most important ones for me. Our first Christmas family photo last year. We got it taken at an old orange plantation which has been turned into a neat family park. 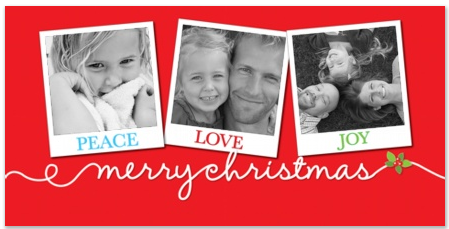 It felt so incredible to be able to make it into beautiful Christmas cards on Snapfish and send them out to family and friends. We have vowed to have family portraits done annually at Christmas especially to capture our daughter as she grows each year. My family never had any portraits done because my mom felt too overweight and now we have no memories, nor one with my parents which is so sad to me. We will have these so my daughter can have copies and see how through the year how she’s changed and so she can see in our faces how happy we are to have her. I am putting aside a Christmas picture each year for her in her Baby Book. I most cherish the pictures of the children and grandchildren!! Just tweeted and am adding @snapfishbyhp right now. Pictures of me and my husband together. My most cherised pictures are of my kids when they were first born. My most cherished photos are those of my kids and husband. I cherish the pictures of my children when they born and our first family picture. What a HARD question to answer! I would say some of the first pictures of my baby boy when he was born but I truly cherish one of my favorite wedding shots of me and my husband outside of the church right after we were married-LOVE IT! I follow you! I cherish pictures with my BFF, my Mom. Pictures of my son and now my dad since he passed a few months ago. Newborn pics of my daughter and husband. Wow, I don’t think I can pick just one! I take a ton of pictures. I can look back through the years and see realize how much I would forget if I didn’t have the pictures to remind me. I love snapfish and also use them for all my photo needs. In fact, I just ordered and received some calendars for Christmas presents. The prices are reasonable and they always have good deals. Picking a favorite picture is a hard one. Right now I think my favorite photo is one of me and my dad from our vacation to France this summer. We both are relaxed and happy which is sometimes a rarity in this crazy world we live in! I love all my photos. I have boxes and albums full and am meticulous about backing up my hard drive so I don’t lose the digital ones! I could never choose just one! I just love looking back at all the photos taken over the years of our two daughters and remembering all the happy and special times with them. I am following Snapfish and Southern Savers on FB. Thanks! Most cherished are pictures of my Grandfather who passed away in 2006. Also, I follow SouthernSavers and Snapfish on Facebook! I love my picture of my whole extended family together. All the photos of my precious girls are cherished. Love looking back at them. Following Snapfish and Southern Savers on FB. Pictures of my 2 yr old kissing his baby sister on her head…..precious! I really cherish the pictures of me with one of my high school friends who passed away a few years ago (we had just graduated college 4 months before). We were close friends and took a lot of pictures. the pictures of my babies! My most cherished photo is of my little boy on a vintage pedal tractor. Hard to call on just one photo, Our family photo or either one of my kids and my Granny that just passed away. The photos of our adopted son, from baby to now toddler, are so precious to me! I follow snapfish and southern savers Both on Facebook!! i follow SS on FB and email. Any picture of the four of us…since I’m the one taking photos, I’m not usually in them! The newborn photos of my 5 grandchildren, who are all under age 3 1/2. I follow Snapfish and SS on Facebook. I love all photos of my family and friends. The ones of my girls, to see them growing as the years go by. I follow Snapfish and Southern Savers on Facebook. I love of course any photo of my boys and little girl, but I have to say I love looking at photos of my mom when she was young. so little photos were taken of her as a young girl, so I cherish every one that I have. The pictures of my grandparents when they were kids. I cherish the unstaged photos showing people just living their life. If I had to pick one photo , it would probably be when my son graduated from kindergarten. He was wearing a little cap and gown. It is so precious. It is hard to pick just one but I would say I have a wedding photo that I cherish the most. I am now following Southernsavers and Snapfish on FB. My precious kids in the beautiful outdoors! It’s hard to just choose one photo! I have SOO many favorites! Tough question. Easter 2011, all four of us in a beautiful flower garden. I follow both Snapfish and Southern Savers on Facebook! I treasure the newborn photos of my little girl most of all. I also hold dear the photos of my grandparents who have now gone to heaven. I love photo of all my grandchildren together at Easter. Wonderful beautiful picture especially to me. Also, tweeted. :) Hoping for a win! the ones of my son! I most cherish photos of family vacations…such great memories and my favorite people of course! I follow Snapfish & Southern Savers on Facebook. our first photo of me, my husband, and our newborn daughter! I follow Southernsavers on facebook. My children’s baby pictures are the pictures I treasure the most! Probably the picture puzzle my husband made for me when he proposed. I have sooo many favorites, it’s hard to narrow it down…but I have one of my grandfather as a little boy standing in overalls in front of an old style pickup truck. It’s just precious. I follow Southern Savers on facebook and by email. Thank you!! Family time during the holidays. Wedding pictures of my children’s wedding are cherished. my favorite photo is one of the last ones we took of my firstborn daughter Janelle before she died on Christmas Day 2006. I cherish the pictures of my 3 children when they are caught off guard playing with each other, laughing, and loving life. I follow snapfish and southernsavers on facebook. My fave pic is of me, my hubby, and our son right after my csection. My favorite photos are of family. I love my pictures from when my boys were born! I also follow you and Snapfish on facebook! The photos I cherish the most ate of my daughter while she was in the NICU. A year later I look at them and see how much she has grown- from 2 lbs to 22 lbs! She is my miracle. My favorite pictures are the candid pics. They truly reflect the happiness in our family. I cherish the most the ones oh my daddy, he passed away and they mean everything to me! I check your site every day – I have already done more than half of my Christmas shopping!!! I also follow you on FB! I couldn’t make a grocery list without your help!!! I follow southern savers on facebook! I love any picture of our family. I follow snapfish on facebook! I cherish my wedding photos and birth photos! I love the picture of my 2 little ones looking at each other. So sweet! I follow southern savers & snapfish on facebook. I cherish all of my kids & family pictures! My most cherished photo was taken the day we brought my firsy child home from the hospital. It captures the teary-eyed joy my husband and I both felt, and shows God goodness to use despite our too-common failings. The photos I cherish the most are the very old ones of my ancestors. The photos I take now are just to help me remember but the photos from before I was born give me a glimpse into the past and where I came from. I follow Southern Savers and Snapfish. I cherish the photos I have of my dad smiling. He died of cancer six years ago. He was a good father and I can’t wait to see him again! I really cherish the photos of my baby girl in the hospital because we didn’t get to take that many as she was rushed off to the NICU. The NICU nurses took two pictures of her for me and those were the only way I saw her for two days. I love them for that!! Eventually we made it out of the NICU and home, but she had already changed so much! I’m so grateful the nurses took the time to document her first hours of life for me. My most favorite pictures are the ones of the day my girls where born. I cherish all the pictures of my daughters when they are truly smiling and not just posing. I’m following you and Snapfish on Facebook! I cherish the photos of my son that passed away more than any other! Wow! I have to pick just ONE picture I cherish most? Hmmmmmmm. I guess I’d have to say the most recent family photo, because it has all the people I cherish most all together. My favorite picture is one of me and my husband and our son just minutes after he was born. I keep it on our bedside table. Like Snapfish and SouthernSavers on facebook. I cherish our yearly family photos. It’s so sweet to look back at my boys pictures spaced a year apart. I love them! I follow Snapfish and Southern Savers on FAcebook! I follow snapfish and Southern Savers on FB! I cherish all of my photos or I wouldn’t have taken them. And I follow Southern Savers and Snap Fish on Facebook. I commented on twitter! It’s so hard to choose, but I love the picture taken right after my daughter was born and handed to me. I cherish each and every picture with my precious daughter and family in them because it’s a moment in time frozen for ever. I most cherish a picture of my little boy and I on the beach. We are forehead to forehead… pure joy. My most cherished photo is of my Father-in-law holding both my children. He truly had a special connection with them, and although they were young when he passed, they still remember him with such fondness. Hard to beat a grandparent’s love. The photo I cherish the most is of my mother at 16 . She moved to New York City at that age and Its the youngest photo I have of her. My mother grew up very poor and there are no pictures of her as a baby or young girl. After thinking about this I will give a copy to my brother and his adult daughters for Christmas. My godmother gave me this picture during my last visit to New York. The picture I cherish the most is the picture of my family (which includes my parents; my brother, his wife & 3 kids; my sister and her 2 kids; my other sister and her 2 kids; and me, my hubby, and our son) which was taken at Sea World about 6 years ago! Looking forward to another family picture when we go back during spring break. This picture will include an addition of 3 more to the family! yay! My favorite photo is a wedding picture of my husband and I with my head on his shoulder. I love snapfish! I also follow snapfish and southern savers on FB! I cherish photos of fond memories with family and friends. I cherish photos of my daughter. I cherish the photo from the day of my wedding of me and my mom. Shes currently battling late stage invasive cervical cancer. So it really means alot to me to be able to remember her when she was strong and healthy. I would say my most cherished photo is one of my grandpa and me. He passed away several years ago, and he very seldom allowed his picture to me taken. We have many pictures of his hands in front of his face– but only 1 of his arms around me! I love and cherish that photo. I’m following Southern Savers and Snapfish on Facebook. Currently my most cherished photo is one of my and my boyfriend, while he was on R and R from Afghanistan. We both look so happy! It helps me get through the days until he comes home for good. My Wedding Pictures, My Childrens Wedding Pictures and my GrandChildren’s birth announcements are my favorites. My favorite photo is our first family photo after the arrival of our second child. My kids are growing too fast so the last ones I just took are the most important b/c they won’t look/act like that for long. So sweet but a little sad!!! my favorite pics are up close ones of my little ones faces. Oh the joy!! I cherish any photo with my mom and my kids. My favorite photo is one of my beautiful daughter laughing and you see all four of her new teeth! keep a photo of my 2 kids hugging that warms my heart. OH, so many choices! I think my favorites would be the ones of me seeing my babies for the first time. I cherish the spontaneous pics that “just happened” snd not a part of a photo shoot…….those are my favorite! I cherish the photo of me holding my bundle of joy for the first time, even though she is almost 7 now, it is a moment i will never forget. I cherish the picture that I took of my daughter just as she woke up from a nap when she was three (she is now nine), I snapped the picture as soon as she opened her eyes, and I looked into the eyes of an angel. When I had my son I was cross country from my family.Most of the time everyone has someone there snapping pics of them and their newborn child I didnt have that. I only have one pic of the three of us when he was first born in the hospital, at first I thought the pic was lost , Thankfully it was sent to my mom and I know have it! I love that photo. The ones of my children and grand children. For sure my sons baby pictures!!! I love any photos of my girls! I cherish my babies’ first year photos. I follow Snapfish and SS on fb. I married a widower with 2 little girls. Their mother died 8 days after having the youngest. The few pictures of all four of them are very precious to all of us. I get the SS daily e-mail. I love my wedding pictures! I love old photos of my grandparents and parents. And of course all the pics of my kids! I would love to be able to print my family’s pictures that are stored in my computer so we could enjoy them all the time. I treasure the first picture of my baby girl after she was born. My kids photos when they were newborns. I follow Snapfish and Southersavers of facebook. My wedding photos that include my uncle who died of cancer suddenly last year are the ones I cherish the most! I follow SS on Facebook! I follow your daily emails! I cherish photos of my son the most! Time goes by so quickly and photos are an easy way to keep little snip-its of times past! The photo I cherish most is one we took while visiting my grandmother when my daughters were much younger. She is holding my youngest on her knee who was a baby then and my oldest was posed on her elbows laying on the floor next to them. My grandmother has since passed away and my daughters are much older. It’s a very sweet picture full of memories! The photos I cherish most are the ones with 4 generations of our family together! I like Snapfish and SS on FB and subscribe to daily emails. I cherish the pictures from when I worked in the Peace Corps. It reminds me of everything I have to be thankful for. I have so many wonderful pictures that I find it impossible to pick one! If I have to choose, I guess it would be one of my Mom and Dad from when they were dating. They are so cute! The pictures I treasure most are the infant pictures of my twin daughters!! I like Southern Savers and snapfish on facebook! I cherish any photo of my new baby! I like Snapfish and Southern Savers on Facebook! I love my family’s first photo…when we went to meet our little one in Ethiopia! My favorite is probably of our firstborn. A couple days old, next to my husband, both asleep with my husband’s hand on his back. The ones of my grandmother that passed away! I love snapfish & southern savers!! I cherish the ones of my father who passed away three and a half years ago the most. Baby pictures of my kids are the ones I cherish the most! I follow both on FB! The ones I cherish the most are the family gettogethers. I am following snapfish and southern savers on facebook! My most cherished photos are the ones of my children with their grandparents and great grandparents. My grandfather passed away Memorial Day and the photo of my son and him is truly precious. I wish he had got to meet his newest great granddaughter in August. I follow Southern Savers on Facebook. I follow both snapfish and southern savers on FB…and have for a while! My most cherished photo is that of my Memaw (Grandmother) and I that was taken the Mother’s Day weekend before she passed away. I don’t really like to get my picture taken but that day I did and knew I had too….and now I understand why. I always follow you all on Facebook, couldn’t live without the coupon help and I use Snapfish so of course I follow them. What would we do without the social network! I follow SS & Snapfish on facebook. The photos that I cherish the most are of my husband and son together where you can see the love between them. I also love the ones of my grandparents because they are no longer here on earth. I just love pictures in general!!! I cherish a photo of my dad and I about 1 week before he passed away unexpectedly. I cherish our wedding photos the most. They’ll always help us remember our special day! I follow Snapfish & SS on FB. I cherish my sons baby photos most. I love the photos I took of my 3 kids at my aunts house in VA. It was on top of a hill and the sun was going down, they turned out awesome. I love our photos of our family of 3! I have a photo of my paternal grandfather in his homemade cloth diaper sitting in a wash bowl framed in my living room. It’s old and weathered but I love it. I cherish the newborn pics of my girls the most. Some of my favorite pics are the ones of me with my oldest adn dearest friends. We may all be pushing 40 now but I love to look back at us as little girls and try not to think about exactly how long we’ve known each other. I receive daily emails from Snapfish and Southern Savers. I follow you and snapfish on facebook. My favorite pictures are from my son’s birth! My favorite photo is my son dressed as Buzz Lightyear. Also, I follow Snapfish and Southern Savers through daily email. A family picture we did last fall, now that were all done. I cherish photos of my family the most, especially photos of me and my 3 siblings. We have always been very close and share so many memories together! I follow Southern Savers, and Snapfish on Facebook! The photos we took of our twins in the NICU are very special to me. i cherrish the picture of us at the park because days like that are the days its so great to have family!! I cherish my wedding picture. I love the picture of my husband and his dog on the edge of a lake. It is the perfect picture of him. He looks perfectly comfortable. My most cherished photo is one my kids gave me on Mother’s Day. It is a picture of the 3 of us at Jekyll Island. I follow Snapfish and Southern Savers on Facebook. I have too many cherished photos to decide which one is the best. The photo that I cherish most is our first family photo, our daughter was only minutes old. Pictures of mu family are the ones I cherish the most!!! I am a FB liker of both…love both so much!!! My wedding photo album means So much! I treasure the photos I have of my girls and my parents together! I love the picture of our entire family that was taken a few years ago. My most cherished photos are of my babies!! Seeing them grow is such a blessing. Liked southern savers & snapfish on Facebook! The few that I have of my brother before he got sick with MS. He passed away almost a year ago. I have three beautiful children and I love looking at their pictures through the years, as they change (and start to look even more alike!). I am a bit of a photo hoarder- so I really cherish pretty much all of them (minus those including me between the ages of 13 and 16- awkward). I guess I most cherish those of people who are no longer with us, grandparents, mother-in-law, etc. as they remind me to capture memories with all my loved ones before it is too late. I cherish the picture of my son in my arms right after he was born. I like Snapfish and Southern Savers on FB. I cherish any picture of my two little girls! I cherish all the pictures of my children. I cherish all of my photos, but especially my children and places where I may never go again, i.e. cruise, Israel. Out of all my photos I cherish the ones of my kids when they were little most. I cherish my daughter’s baby pictures the most. Love Snapfish & Southern Savers! Great deals! Oh and I do follow you and snapfish already on FB, thanks for the giveaway! I cherish our wedding photos. There was so much going on around the time we got married, but I have such great memories of that day, I can’t help but grin whenever I see those photos. I treasure pictures of my family that are no longer with me. I cherish a picture of my husband and my 2 boys that was taken on the beach! Makes me melt every time I see it!! I have a photo of my husband when he was a flight medic standing 14 stories up on the UAMS helipad next to his helicopter. I’ve ALWAYS cherished that photo and have wanted to preserve it and show it off in a canvas since the day I saw it. It truly is amazing! I am so proud of him for all the lives he has saved. I cherish my babies’ photos the most. I also follow snapfish and Southern Savers on Facebook! I cherish the photos of my husband with our kids. Their bond is so special! I follow southernsavers and snapfish o facebook. My most cherished photos are the ones me and my husband were able to pull out of our house fire. Memories we would have never gotten back if we hadn’t been able to pull them ut. Out of all my photos the ones I cherish most are one special wedding picture of my husband and I, and one of me with each one of my 3 children right after they were born. I cherish the photos of me and my children visiting the World Trade Center. I borrowed my son’s HP printer so I could print out all your coupons, so it would be fantastic to win a new HP printer so I can give his back to him for college! I love the pictures my aunt gave to me at my bridal shower. I didn’t have any babyy pictures of myself until she gave me the album. Out of all my photos the one I cherish the most is one I took of my Husband in his firefighter uniform holding our 3 year old son. The one photo I cherish the most is with my grandparents and my oldest child when he was 2 years old. We take so many photos I really can’t pick a favorite, but I love the pictures of my kids. I follow you on fb and emails. I follow on Facebook and the daily email. I love so many of the pictures of my family and kids, but a special one is of my grandmother who is now in heaven, my mother, me and my daughter. I’m named after my grandmother and my daughter is named after my mother! Four special generations! Oh my, you guys are SO generous – thanks for the chance at winning! Which photo do I cherish most?? Well, seems my husband pointed out that in the past year+ I’ve taken more pictures of (in this order) our grandson…and my shopping deals than I have of him. So, I’ll have to go with my most cherished as the one of my daughter holding her baby boy in the shadows of a beautiful, bright sun! Oh, but of course I follow you on FB — wouldn’t have it any other way! I love the pics of my kids. My favorite pic is of my son when he was two looking at the Christmas tree with just the light of the tree putting the sweetest glow on his face. I like both Snapfish and Southernsavers on Facebook. That is tough but it is a tie between a picture of my brother and I or the day my daughter was born. I have 2 favorites. #1 pictures of my Daddy baptizing me when I was 7 years old in a creek in Nashville. The few photos I have of my parents and my sister who are now deceased. The photo I cherish the most is a picture of my tiny newborn son with his dad looking down on him and a photo of my newborn daughter being held by her big brother. I subscribe to southern savers by email, and facebook. Love it. Gonna give snapfish a try! I love the photo of me in my christening gown when I was a baby. I most cherish the photo of me and my Mom taken about 6 months prior to her passing. Definitely pictures of my children as newborns – I love their first bath pictures! I will never forget that new baby smell. my family pics are most important to me. especially the ones that catch my children’s everyday moments and expressions so i can remember them as they grow up. The photos of my kids when they were newborns! My favorite is of my newest daughter at 3 days old wearing a little sister shirt while my older son and daughter cradle her together in thier arms, each wearing their big brother and big sister shirts. I can’t possibly answer that!! A family photo for sure but which one I can’t decide. My favorite photo is one of my daughter when she was 3 months she looks so serious, but cute! My children’s baby photos, and the family photos, of course! I subscribe to SS daily e-mail, and am signed up for e-mails with Snapfish. My baby girl after her open heart surgery waking up…. she was alive and without the problem…. Every Christmas we alternate years of family photos & kid’s photos. I love looking back over the years @ how much they’ve grown. So I guess my favorite photo would be our annual Christmas photo. I cherish the newborn photos of my daughter the most. Favorites are the ones of my 3 kids together or sweet Father/Daughter or Mother/Daughter moments. I FOLLOW U ON FB! MY CHILDRENS FIRST PICTURE IN THE HOSPIAL! I have one pic of my husband and I just after our wedding ceremony. We are looking at each other and so happy that we were finally married. The smiles weren’t faked in that picture. Priceless! I cherish the photographs of my kids the most. I don’t have many pictures from when I was a kid so these are important to me. I’m following Southern Savers & Snapfish on fb! i cherish the ones of my youth, with parents, aunts, uncles, grandparents, etc. i hope my kids will come to cherish the gazillion photos i’ve taken of them over the years. lol. My most cherished photo: one of my Dad holding me when I was about a year old. Every picture of my child is my most cherrished. They all show different facets of his personality and I love it. But if I has to choose one it would be one of him in the bath tub looking over his shoulder and smiling at me. I “liked” both snapfish and southernsavers on Facebook. My most cherished picture is hard to choose. I guess I would have to pick the family picture we took before my mother died. It is very important to me! I cherish my photos of my daughter. I follow southernsavers on daily e-mail and I also follow snapfish by e-mail. The photo I cherish the most is the one I took from behind of my husband walking hand in hand with our two children the day he graduated from Basic Training! So much pride and love in one photo! I am a photo freak with thousands of pics on my computer. My husband purchased a new computer with a terrabite of memory so I could have all my pics on hand. I am a child care provider and have made books for each of the children to document the past year. I have also purchased many photo blankets from Snapfish for Christmas gifts and follow Snapfish and Southern Savers on facebook!! I cherish my family photo the most. I love the picture of my daughter when I held her for the first time! My daughter who passed away. You never know how precious a picture can be. I cherish my childhood photos the most. My wedding photos are my most cherished. I cherish the few pictures we have of when my siblings and I were babies. When we immigrated to the US, we had just the clothes on our backs. Everything we owned was lost. My children, of course. And the pics of my mother who passed in 1992. Since my husband passed away this year the pictures of him with the grandchildren are so precious to us all. I follow Southern Savers & Snapfish on facebook (Linda Bradley). I’m also an email subscriber. I cherish my pictures of my children the most. I most cherish the pitcures of my grandparents when they were young. It it so iterestingto me. I have a picture framed of both my grandfathers in their military uniforms. My favorite picture is one of me with my kids…both are smiling, happy, and things look perfect! I follow you and Snapfish on FB. I cherish our picture of our little one’s first Christmas opening presents all by himself. He was so excited! I love looking back at family pictures and pictures of my husband & me holding our boys when they were born. I follow Snapfish & Southern Savers on facebook. Also subscribe to your emails. My favorite picture is the first Christmas we had our son. He was only 3 weeks old and the look of terror and “new parent” fear is stilll evident on my husband and my faces! He’s now 2 ans we couldn’t imagine a world without him! It would have to be my kid’s pictures! I follow on Facebook and daily emails. I cherish a family photo we had taken several years ago. I still love looking at it! first baby photos and wedding photos…hard to choose favorites when we have so many great ones! Photography is a hobby of mine so this would be perfect! I cherish the pictures of my kids the most! A photo of me and my grandfather. the newborn pictures of my kids. They just aren’t little like that very long. I have a great picture of all three boys and it is my favorite. my favorite photo out of all is my husband with all 3 girls. I cherish the dating years of my husband and I the most. The photos I cherish the most would be the pictures of my girls births and the ones of them throughout their lives. I cherish the first photo of my twins together, when I first met them! I am follower of Snapfish and SS on FB! I cherish most the pictures that I have of my grandparents. They are gone but not forgotten. My son’s photos…especially the first few weeks because he changed so much. Baby pictures of my kids because they grow sooo fast! All the photos of my son of course! I follow both you and snapfish on facebook. I cherish my photos of my dad on a trip to Ireland, which he had always dreamed of visiting. I can’t pick a photo I cherish the most. I love my current ones, my ones of my girls being babies, my wedding pictures, pictures of my childhood…I just can’t pick. The ones of my kids when they are about 6 months old. I cherish photos of my kids when they young. my deceased Dad and my grandparents. Probably my wedding photos. They are in a box. I don’t look at them often. But when I do, it’s so nice to relive that happy day of my youth! My wedding photos and my baby’s pictures. I follow both on FB. I cherish our first family picture after the birth of our second son. My most treasured photos are of each of my children when they were first born. i get your daily emails. I love all my photos– my scrapbooks that highlights them continue to haunt me that I must get back to scrapping! Of course, the photos of my crazy 7 yr. old boy capture my heart probably the most– who can resist him?? i like snapfish and southern savers on facebook!!! I cherish the photos of my children when they were born. I love pictures of family, especially my kids. following snapfish and southern savers on facebook! right now i cherish the pics of me as a kid with my parents cuz as i get older those memories are getting foggier and the pics help me to remember! The pics i have of my mom, like her school photos. i follow you on fb and twitter and tweeted this giveaway. I think my wedding and newborn baby photos for my kids! I alos love the candids of the kids just living and being so full of excitement! I love all the pictures of my kids over the years. I cherish my wedding photos and the photos of our daughters the most. I like both you and Snapfish on Facebook. The photo I cherish most is one of my dad. It’s the only photo of him I have. My wedding/honeymoon photos! We were able to have a destination wedding and my whole family was able to go. I really cherish these photos of my whole family! The photo of all my babies together. Any picture where you can see all three of my kids faces. They always seem to be looking everywhere but at the camara! I treasure the photos from my daughters’ birth the most. There is something about those first few moments of life that is so precious. I cherish our family photos the most. I cherish the baby pictures the most!